The classic “Dogs of the Dow” strategy advises buying the 10 highest-yielding Dow Jones Industrial Average stocks, then holding onto them for a year. The idea is that higher yields are a signal of a beaten-up share price – and that because we’re buying a stable blue-chip with a stable customer base, investors will eventually bid the stock back up when the business cycle turns up again. [ad#Google Adsense 336×280-IA]But we can further improve on this effective yet somewhat “dumb” strategy with a bit of second-level analysis. After all, some of these companies have business models that are actually aging in dog years! And they should be avoided. Today we’re going to discuss four high paying Dow components. Two are compelling buys, while two should be sold immediately (or even shorted). Exxon Mobil (XOM) is emerging from what easily has been one of the most trying points in the company’s history, the roots of which stretch all the way back to 1870. From about mid-2014 through the start of 2016, oil prices plunged from near $110 down to below $30 – a collapse that caused energy stocks across the sector to careen into the ground, and forced numerous companies to shut their doors. Even Exxon Mobil – America’s biggest energy company by market capitalization, and one of the world’s largest and most diversified oil and gas operations – wasn’t immune. Shares dipped from around $105 to around $72 or so – a 30%-plus dip in just more than a year’s time, which is virtually unheard of in blue chips as well-established as XOM. Pundits thought that Exxon’s streak of dividend increases, which spanned more than three decades, was in jeopardy. However, former CEO Rex Tillerson himself managed the company in such a way that he knew its operations could survive with oil prices as low as $40 per barrel. 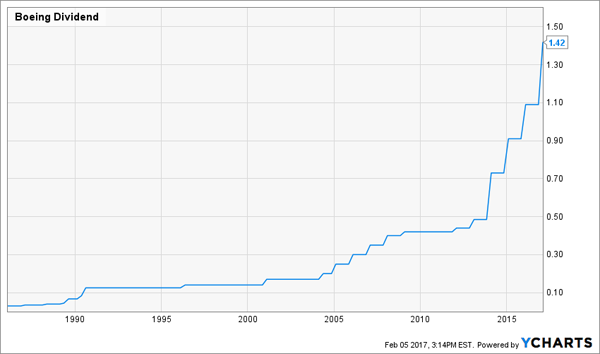 April 2016 came around, and XOM maintained its status as a Dividend Aristocrat with a small but symbolic payout hike. Meanwhile, XOM shares have clawed back at least some of their losses. The former Exxon CEO is a “former” chief because he’s now America’s Secretary of State. That’s no doubt a boon to XOM, especially considering the Trump administration’s seemingly favorable and cooperative view with Russia – where Exxon has huge energy interests and projects, and where Tillerson himself has deep ties. Moreover, President Donald Trump and a GOP-controlled Congress are proving extremely friendly to the energy sector as a whole right now, most recently with a Senate vote to knock down a rule governing transparency on energy firms’ payments to foreign governments. Exxon was already set up well to benefit from an eventual return to high oil prices, and now it’s seemingly in the driver’s seat. While investors wait for those gains to take hold, they can enjoy 3.6% in dividends from this relentless oil titan. Walmart (WMT) is one of the perfect examples of how a big, solid blue-chip can still be a big, solid dud. Walmart is the largest retailer in the world, and in fact Earth’s biggest company by revenue, boasting more than 11,000 stores across 28 countries. Before Amazon.com (AMZN) came around, Walmart was considered one of the biggest disruptors to traditional brick-and-mortar retail. Its bargain-basement prices and enormous product offerings upended countless mom ‘n’ pop shops, but also put the hurt to larger specialty retailers such as Best Buy (BBY) and H.H.Gregg (HGG). But Amazon did come along, and that – along with Walmart’s ubiquity and lack of options for expansion – are at the very least keeping Walmart from being the investment powerhouse it once was. Walmart has been spending for years trying to bring its online offerings up to par to battle Amazon’s unstoppable e-commerce machine – yet it just keeps falling farther behind. Dividend growth is lagging too – last year management upped its payout by a meager 2%. 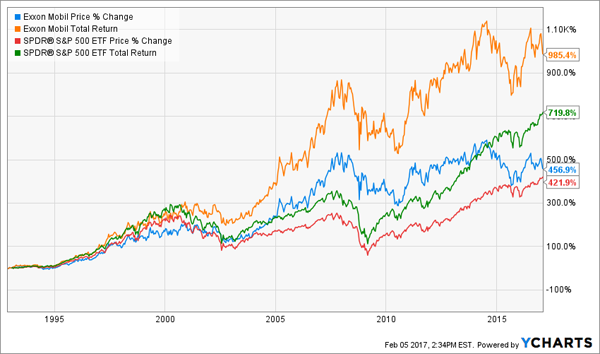 WMT has lagged the total returns of the S&P 500 for the last 15 years – it’s time to cut this dead weight loose. Boeing (BA) just boosted its dividend by 30% to $1.42 per share – more than double its quarterly payout from 2013! And Boeing’s generosity to shareholders didn’t stop there. The company also upgraded its old stock repurchase program by implementing a new $14 billion buyback plan. Future business prospects are looking good. Boeing said it expects 2017 commercial aircraft deliveries to reach between 760 and 765, up from last year’s 748. Core earnings are expected to surge from $7.24 per share to a range of $9.10 to $9.30 per share. 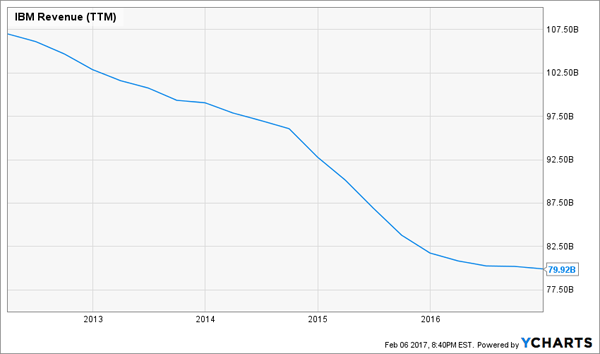 And Boeing sees cash flow ticking up from $10.5 billion last year to $10.75 billion in 2017 – plenty of cash to dish back to shareholders. Nineteen straight quarters of year-over-year revenue declines – ‘nuff said. IBM’s (IBM) core businesses, such as services and software licenses, have declined on a year-over-year basis for 19 straight quarters. And it’s a bad sign that the company still won’t break out its Watson revenues, despite the fact IBM says its promising artificial intelligence unit is growing briskly. IBM’s 2016 dividend hike dipped into single digits after years of double-digit improvements. Cash and short-term investments have dipped from about $11 billion in 2013 to $8.5 billion as of its last report … and long-term debt has climbed from $32.9 billion to $34.7 billion in that same time. And that streak of consecutive revenue declines? If Wall Street is right, it’ll be extended at least by a couple more quarters, and both 2017 and 2018 revenues are seen eroding, not recovering. IBM might survive for an eternity, but it won’t grow your money for you. Every portfolio has room for Dow Jones stalwarts like Boeing and Exxon Mobil that will throw off serious dividends and actually help grow your nest egg in the process. But Boeing and especially Exxon Mobil could see some significant moves in either direction depending on how the winds in Washington blow over the next few years. And I don’t know about you, but I don’t want to have to check CNN headlines and Donald Trump’s Twitter account every single day just to make sure my retirement holdings are still in the clear. That’s why my latest stock research has been focused on a 1-2 punch of high yields and all-weather performance. I’ve just put together a new FREE report, “The Best 7% Dividends for 2017,” that features bulletproof yields of 7%, 8% … even double digits. Yes, we need big yields to make it to the retirement finish line comfortably intact, but we also need stocks that can go on the offensive when bull markets take hold, yet also won’t shiver at the first sniff of macroeconomic uncertainty. The Federal Reserve could throw three interest-rate hikes at us this year, or it could do what it did the past two years and deliver just one rate hike. Donald Trump could justify the big sector moves from the past couple of months by delivering on his campaign promises … or Washington could deliver a bunch of compromises that temper the bulls’ expectations. China could rattle more sabers in the South China Sea. The Brexit could take a more definite shape and send international investors into a panic once more. With these top dividend picks, you don’t have to worry about any of that! The only thing you’ll need to worry about is how you’re going to enjoy your retirement. That’s because each of these stock picks offer big dividend yields AND 12% to 38% price upside! That means you’re not just collecting dividends while maintaining your nest egg – you’re growing your funds in retirement! Make your retirement portfolio everything-proof today! Click here and I’ll provide you with THREE special reports outlining each of my Best 7% Dividends for 2017 – names, tickers, buy prices and full analysis of their shocking upside potential – for absolutely FREE!